Preserved Juniper Bonsai Click on each photo for a larger image. These fine custom-made works of art are indistinguishable from live evergreen bonsai. Please note, shapes vary since these are natural items. Bonsai containers are included as shown. Available from 9 inches tall to 8 feet tall. 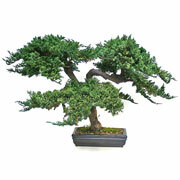 See also our Signature Series line of bonsai trees. 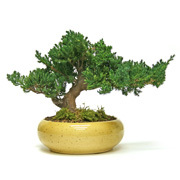 Preserved Juniper Bonsai by Mall Silks are some of our most realistic products. 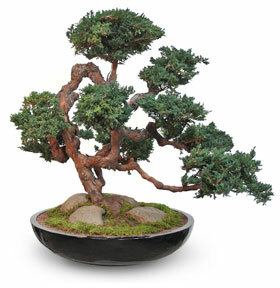 These bonsai are made using either grapewood or dragonwood for the trunks and naturally preserved juniper branches. The trunks are fabricated by Mall Silks designers into a structurally pleasing bonsai trunk either in a custom made base or a container of your choice. Then natural preserved juniper branches are added to the trunk using a variety of methods developed by our production team. The transitions between the trunk and the stems are sculpted and then painted to match the color of the trunk for an artistic finish. 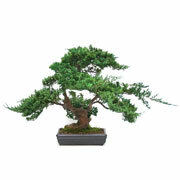 These delicate bonsai forms are extremely realistic and will fool even a trained plant professional. They are unfortunately only for interior use as the preserved foliage will degrade over time if exposed to direct sunlight. The best part is that they are virtually maintenance free and will last in great condition for many years with no maintenance. They can be made in sizes from small 9" desktop plants all the way to custom sizes over 8' tall. 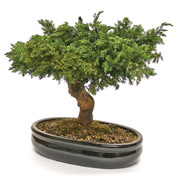 Please contact us to learn more about using one of these wonderful bonsais on your next project, or if you'd like several for various locations in your office. To order call 1-888-SILKS-01 (1-888-745-5701) or E-MAIL US.